Subra Suresh addressing the audience. Emma Lundberg presenting "How to make gamers do science: Project Discovery"
Poster session in full swing. 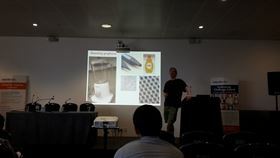 Jonathan Coleman presenting "Kitchen Physics: Using physics to produce state of the art nanomaterials using household implements"
Panel discussion on taking materials discovery and development to the next level . (Left to right- David Rugg, Nicola Marzari and Sohini Kar-Narayan). For four days in September, scientists and engineers took over ExCel London. During this, the inaugural New Scientist Live festival, visitors were treated to everything from Comet 67P and supersonic cars, to probes and 3D printers. Ideas and discovery were the key themes of the festival, and this was reflected in the impressive line-up, that included astronaut Tim Peake, leading researchers, authors, speakers from all sectors of society. On Friday 23rd September, the Materials Today team hosted their own event at the festival. ‘Materials Today at NSLive’ brought together some of the best of materials science, to talk about topics as diverse as science communication and the use of modelling in materials development. 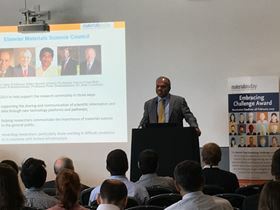 It offered attendees a unique opportunity to network with, and learn from, thought leaders across the materials spectrum, exemplified by the welcome from Prof. Subra Suresh, Chair of the Elsevier Materials Science Council. He emphasized the value of communication between researchers and the public, and urged the diverse crowd to talk about their work more, setting the tone for the day. A more efficient use of materials was also at the heart of the second talk, from Prof. Abhay Pandit, Director of the Centre for Research in Medical Devices at the National University of Ireland, Galway. He started by putting current biomaterials into the context of the early days of mass manufacturing, “Nylon, silicones and stainless steel were not designed specifically for use in biology. We’re now looking for a better approach.” Part of his work is inspired by his own identity, and the fact that humans are living longer than ever before, “We are an ageing society. By 2050, 1 in 3 will be over 65. That comes with challenges." Ageing took on a different meaning for the next speaker, Dr. Eleanor Schofield, Head of Conservation and Collections Care at The Mary Rose Trust. She discussed the challenges of treating archaeological samples, and highlighted the importance of collaborations with academia to develop new, improved options. Preserving wood is particularly challenging, as Eleanor described, "We first sprayed the remains of the Mary Rose in polyethylene glycol. Once we'd done that, we could dry it, preserving the structure of the wood for many years to come." Iron nails embedded in the wood come with their own interesting chemistry, as does storing samples – both of which are active research projects that Eleanor is managing. The morning’s talks were followed by a fascinating and lively panel discussion on science communication. The chair, Dr Michael Weir from the University of Sheffield, was joined by Mark, Abhay, and Eleanor, alongside Dr Alan Leshner, CEO Emeritus of AAAS. They compared notes on what has worked well in the past, and what we’ll need to do in the future to inspire the next generation of materials scientists. All felt confident that there had been a shift in attitudes, and that scientists of all levels were now reaping the benefits of communicating with the public. After ably managing a series of tough questions from the audience, the panel closed the morning’s programme. The afternoon started with a computer-game-like bang, thanks to Prof. Emma Lundberg, from KTH Royal Institute of Technology. 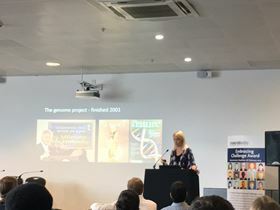 She spoke about the important role that gamers are playing in developing the Human Protein Atlas. Fans of the online game Eve Online have, for several months, been taking part in a citizen science project, to classify patterns in microscope images of proteins. Remarkably, since March, “The gamers have carried out 13 million classifications, and this has led to several new findings which will soon be published”. Prof. Nikola Marzari uses computers rather differently for his work. As Head of the Laboratory of Theory and Simulation of Materials at EPFL, multiscale modelling is his focus. He talked about the use of informatics in materials discovery, and emphasised the need for accuracy and realistic complexity in the models. One of Nicola’s current interests is nanostructures, “By looking at materials data and binding energies from a range of databases, we’ve identified more than 1800 potential 2D materials”. This was music to the ears of the day’s final speaker, Prof. Jonathan Coleman, Principal Investigator of the Low-Dimensional Nanostructures group at Trinity College Dublin. His research focuses on graphene and other 2D materials, but his talk was titled ‘kitchen physics’. He took the audience on a whistle-stop-tour of some of his group’s work, including graphene-rubber composites that can continuously measure blood pressure, and extracting graphene using a household blender (which, by the way, needs to be > 150W). This was followed by an afternoon panel chaired by Laurie Winkless, regular contributor to Materials Today. She was joined by Nikola, along with Prof. David Rugg from Rolls-Royce, and Prof. Sohini Kar-Narayan from the University of Cambridge. The topic up for discussion was discovery and development. The conversation started on the growing link between modelling and experiments in materials science, and approached the question “Will modelling ever replace lab work?” (The answer? No!) 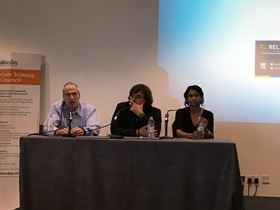 The panel also discussed the need for closer connections between academia and industry, and the changing nature of skills that tomorrow’s scientists will need. The audience again had lots of questions, which led to a stimulating discussion. 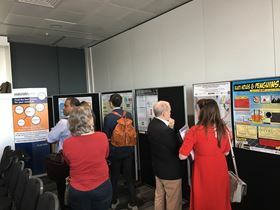 The programme ended with a poster session, which hugely impressed the judges and the Elsevier Materials Science Council. All agreed that we should feel confident about the future of materials science in the UK. The networking continued into the evening, and it seems that several collaborations were forged over the ‘molecular cocktails’ and 3D printing on offer. Feedback for the event has been overwhelmingly positive, so expect to see another Materials Today event soon!